"A picture is worth a thousand words!” We all know it’s true, and that is why National Readerboard has developed our unique Picture Panels. We have chosen highly recognizable symbols to quickly let your customers know about your business, and to make sure that the messages you want to emphasize stand out LOUD and CLEAR. 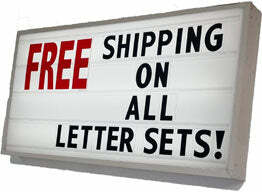 Picture Panels are the same size and go up on your outside sign the same easy way as your regular letters and numbers. Bright colors stand out and differentiate you from your competitors. Don’t see what you want? Let us know! We make to order and are happy to create a Picture Panel just for you and your business. Just call 800.243.6676 to let us help you customize your sign and have fun doing it. Check out our Marquee Graphics and Giant Price Points to see how you can create an even more unique and vibrant message display.